All 2017 Flag Officer announcements for the U.S. Navy. Senior naval officers with a pay-grade of O-7 and above are recognized as Flag Officers and carry the titles of an admiral, vice admiral, or rear admiral (above the rank of Captain). Navy Rear Adm. Richard A. Brown for appointment to the rank of vice admiral, and for assignment as commander, Naval Surface Forces; and commander, Naval Surface Force, U.S. Pacific Fleet, San Diego, California. Brown is currently serving as commander, Navy Personnel Command; and deputy chief of Naval Personnel, Millington, Tennessee. Navy Rear Adm. Nancy A. Norton for appointment to the rank of vice admiral, and for assignment as director, Defense Information Systems Agency; and commander, Joint Forces Headquarters-Department of Defense Information Network, Fort Meade, Maryland. Norton is currently serving as vice director, Defense Information Systems Agency, Fort Meade, Maryland. Navy Rear Adm. Lisa M. Franchetti for appointment to the rank of vice admiral, and for assignment as commander, Sixth Fleet; commander, Task Force Six; commander, Striking and Support Forces NATO; deputy commander, U.S. Naval Forces Europe; deputy commander, U.S. Naval Forces Africa; and Joint Force Maritime Component commander Europe, Naples, Italy. Franchetti is currently serving as chief of staff, J5, Joint Staff, Pentagon, Washington, District of Columbia. Navy Vice Adm. Christopher W. Grady for reappointment to the rank of vice admiral, and for assignment as assistant to the Chairman of the Joint Chiefs of Staff, Pentagon, Washington, District of Columbia. Grady is currently serving as commander, Sixth Fleet; commander, Task Force Six; commander, Striking and Support Forces NATO; deputy commander, U.S. Naval Forces Europe; deputy commander, U.S. Naval Forces Africa; and Joint Force Maritime Component commander Europe, Naples, Italy. Navy Rear Adm. Bruce H. Lindsey for appointment to the rank of vice admiral, and for assignment as deputy commander, U.S. Fleet Forces Command, Norfolk, Virginia. Lindsey is currently serving as commander, Naval Air Force, U.S. Atlantic Fleet, Norfolk, Virginia. Navy Capt. Michael E. Boyle has been nominated for appointment to the rank of rear admiral (lower half). Boyle is currently serving as director for international engagement, N52, Office of the Chief of Naval Operations, Washington, District of Columbia. Vice Adm. John C. Aquilino for reappointment to the rank of vice admiral, and for assignment as commander, U.S. Naval Forces, Central Command; and commander, Fifth Fleet, in Bahrain. Aquilino is currently serving as deputy chief of naval operations for operations, plans, and strategy, N3/N5, Office of the Chief of Naval Operations, Pentagon, Washington, District of Columbia. Rear Adm. John D. Alexander for appointment to the rank of vice admiral, and for assignment as commander, U.S. Third Fleet, San Diego, California. Alexander is currently serving as director, joint fleet operations, N3/N5, U.S. Fleet Forces Command, Norfolk, Virginia. Rear Adm. William R. Merz for appointment to the rank of vice admiral, and for assignment as deputy chief of naval operations for warfare systems, N9, Office of the Chief of Naval Operations, Pentagon, Washington, District of Columbia. Merz is currently serving as director, Undersea Warfare Division, N97, Office of the Chief of Naval Operations, Pentagon, Washington, District of Columbia. Navy Rear Adm. DeWolfe H. Miller III, for appointment to the rank of vice admiral, and for assignment as commander, Naval Air Forces; and commander, Naval Air Force, U.S. Pacific Fleet, San Diego, California. Miller is currently serving as director, Air Warfare Division, N98, Office of the Chief of Naval Operations, Pentagon, Washington, District of Columbia. Navy Rear Adm. Frederick J. Roegge, for appointment to the rank of vice admiral, and for assignment as president, National Defense University, Washington, District of Columbia. Roegge is currently serving as commander, Submarine Force, U.S. Pacific Fleet, Pearl Harbor, Hawaii. Rear Adm. (lower half) Ross A. Myers has been nominated for appointment to the rank of rear admiral. Myers is currently serving as commander, Carrier Strike Group Fifteen, San Diego, California. Capt. Daniel W. Dwyer has been nominated for appointment to the rank of rear admiral (lower half). Dwyer is currently serving as chief of staff/deputy chief of staff for strategy, resources, and plans, N5, U.S. Naval Forces Europe/Africa/U.S. Sixth Fleet, Naples, Italy. Navy Vice Adm. James G. Foggo III for appointment to the rank of admiral, and for assignment as commander, U.S. Naval Forces Europe; commander, U.S. Naval Forces Africa; and commander, Allied Joint Forces Command, Naples, Italy. Foggo is currently serving as director, Navy Staff, N09B, Office of the Chief of Naval Operations, Pentagon, Washington, District of Columbia. Navy Rear Adm. (lower half) Ann M. Burkhardt for appointment to the rank of rear admiral. Burkhardt is currently serving as director, Department of Defense, Sexual Assault Prevention and Response Office, Arlington, Virginia. Navy Reserve Rear Adm. (lower half) Daniel B. Hendrickson has been nominated for appointment to the rank of rear admiral. Hendrickson is currently serving as director, Theater Engagement, J7, U.S. Southern Command, Doral, Florida. Navy Reserve Rear Adm. (lower half) Keith M. Jones has been nominated for appointment to the rank of rear admiral. Jones is currently serving as commander, Navy Expeditionary Logistics Support Group, Williamsburg, Virginia. Navy Reserve Rear Adm. (lower half) Daniel J. MacDonnell has been nominated for appointment to the rank of rear admiral. MacDonnell is currently serving as commander, Naval Information Force Reserve, Fort Worth, Texas. Navy Reserve Rear Adm. (lower half) Thomas W. Marotta has been nominated for appointment to the rank of rear admiral. Marotta is currently serving as reserve deputy commander, U.S. Naval Forces Central Command, U.S. Fifth Fleet, Manama, Bahrain. Navy Reserve Rear Adm. (lower half) Matthew A. Zirkle has been nominated for appointment to the rank of rear admiral. Zirkle is currently serving as deputy chief of staff, Submarines, NATO Maritime Command, Northwood, United Kingdom. Navy Reserve Capt. Eugene A. Burcher has been nominated for appointment to the rank of rear admiral (lower half). Burcher is currently serving as deputy, Navy Emergency Preparedness Liaison Officer, Navy Installations Command Headquarters, Washington, District of Columbia. Navy Reserve Capt. James M. Butler has been nominated for appointment to the rank of rear admiral (lower half). Butler is currently serving as community lead, Naval Information Force Reserve Headquarters, N9, Fort Worth, Texas. Navy Reserve Capt. Rodney P. Dewalt has been nominated for appointment to the rank of rear admiral (lower half). Dewalt is currently serving as reserve commanding officer, Navy Installations Command Headquarters, Washington, District of Columbia. Navy Reserve Capt. Joey B. Dodgen has been nominated for appointment to the rank of rear admiral (lower half). Dodgen is currently serving as deputy commander, Navy Region Southeast Reserve Component Command, Jacksonville, Florida. Navy Reserve Capt. Jacquelyn McClelland has been nominated for appointment to the rank of rear admiral (lower half). McClelland is currently serving as reserve logistics officer, Naval Supply Systems Command, Global Logistics Support Headquarters, San Diego, California. Navy Reserve Capt. Andrew J. Mueller has been nominated for appointment to the rank of rear admiral (lower half). Mueller is currently serving as reserve chief of staff, deputy chief of naval operations for operations, plans, and strategy, N3N5, Office of the Chief of Naval Operations, Washington, District of Columbia. Navy Reserve Capt. Richard A. Rodriguez has been nominated for appointment to the rank of rear admiral (lower half). Rodriguez is currently serving as chief of staff, Combined Joint Task Force, Horn of Africa, Camp Lemonnier, Djibouti. Navy Capt. Gregory N. Harris has been nominated for appointment to the rank of rear admiral (lower half). Harris is currently serving as commander, Naval Aviation Warfighting Development Center, Fallon, Nevada. Navy Capt. Samuel J. Paparo Jr., has been nominated for appointment to the rank of rear admiral (lower half). Paparo is currently serving as a Navy corporate fellow in corporate strategy, Lockheed Martin, Bethesda, Maryland. Navy Rear Adm. Phillip G. Sawyer has been nominated for appointment to the rank of vice admiral, and for assignment as commander, Seventh Fleet, Yokosuka, Japan. Sawyer is currently serving as deputy commander, U.S. Pacific Fleet, Pearl Harbor, Hawaii. Capt. Karl O. Thomas has been nominated for appointment to the rank of rear admiral (lower half). Thomas is currently serving as director, 21st Century Sailor Office, N17, Office of the Chief of Naval Operations, Arlington, Virginia. Navy Rear Adm. Mathias W. Winter for appointment to the rank of vice admiral, and for assignment as director, Joint Strike Fighter Program, Office of the Secretary of Defense, Arlington, Virginia. Winter is currently serving as deputy program executive officer, F-35 Lighting II, Arlington, Virginia. Navy Rear Adm. David H. Lewis for appointment to the rank of vice admiral, and for assignment as director, Defense Contract Management Agency, Fort Lee, Virginia. Lewis is currently serving as commander, Space and Naval Warfare Systems Command, San Diego, California. Navy Rear Adm. (lower half) Jon A. Hill for appointment to the rank of rear admiral. Hill is currently serving as deputy director, Missile Defense Agency, Fort Belvoir, Virginia. Navy Rear Adm. (lower half) Steven L. Parode for appointment to the rank of rear admiral. Parode is currently serving as deputy chief, Tailored Access Operations, S32, National Security Agency, Fort Meade, Maryland. Navy Rear Adm. (lower half) Gordon D. Peters for appointment to the rank of rear admiral. Peters is currently serving as program executive officer, Air Anti-Submarine Warfare, Assault and Special Mission Programs, Patuxent River, Maryland. Navy Rear Admiral (lower half) John P. Polowczyk for appointment to the rank of rear admiral. Polowczyk is currently serving as director, Supply, Ordnance and Logistics Operations Division, N41, Office of the Chief of Naval Operations, Washington, District of Columbia. Navy Rear Adm. (lower half) Richard A. Brown has been nominated for appointment to the rank of rear admiral. Brown is currently serving as commander, Navy Personnel Command; and deputy chief of Naval Personnel, Millington, Tennessee. Navy Rear Adm. (lower half) James S. Bynum has been nominated for appointment to the rank of rear admiral. Bynum is currently serving as commander, Carrier Strike Group Nine, San Diego, California. Navy Rear Adm. (lower half) Daryl L. Caudle has been nominated for appointment to the rank of rear admiral. Caudle is currently serving as director, plans and operations, U.S. Naval Forces Europe; deputy commander, Sixth Fleet; commander, submarines, Allied Naval Forces South; and commander, Submarine Group Eight, Naples, Italy. Navy Rear Adm. (lower half) Richard A. Correll has been nominated for appointment to the rank of rear admiral. 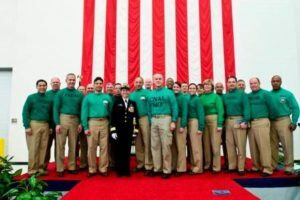 Correll is currently serving as commander, Submarine Group Seven; commander, Task Force Seven Four; and commander, Task Force Five Four, Yokosuka, Japan. Navy Rear Adm. (lower half) Randy B. Crites has been nominated for appointment to the rank of rear admiral. Crites is currently serving as commander, Submarine Group Ten, Kings Bay, Georgia. Navy Rear Adm. (lower half) Daniel H. Fillion has been nominated for appointment to the rank of rear admiral. Fillion is currently serving as director, global operations, J3, U.S. Strategic Command, Offutt Air Force Base, Nebraska. Navy Rear Adm. (lower half) Collin P. Green has been nominated for appointment to the rank of rear admiral. Green is currently serving as commander, Special Operations Command South, Homestead Air Reserve Base, Florida. Navy Rear Adm. (lower half) Mary M. Jackson has been nominated for appointment to the rank of rear admiral. Jackson is currently serving as commander, Navy Region Southeast, Jacksonville, Florida. Navy Rear Adm. (lower half) James W. Kilby has been nominated for appointment to the rank of rear admiral. Kilby is currently serving as commander, Carrier Strike Group One, North Island, California. Navy Rear Adm. (lower half) James J. Malloy has been nominated for appointment to the rank of rear admiral. Malloy is currently serving as commander, Carrier Strike Group Ten, Norfolk, Virginia. Navy Rear Adm. (lower half) John W. Tammen Jr., has been nominated for appointment to the rank of rear admiral. Tammen is currently serving as commander, Submarine Group Nine, Silverdale, Washington. Navy Capt. Edward L. Anderson has been nominated for appointment to the rank of rear admiral (lower half). Anderson is currently serving as major program manager for integration, Program Executive Officer for Command, Control, Communications, Computers, and Intelligence, San Diego, California. Navy Capt. Stuart P. Baker has been nominated for appointment to the rank of rear admiral (lower half). Baker is currently serving as executive assistant, U.S. Fleet Forces Command, Norfolk, Virginia. Navy Capt. Michael D. Bernacchi Jr., has been nominated for appointment to the rank of rear admiral (lower half). Bernacchi is currently serving as executive assistant to the vice chief of naval operations, Washington, District of Columbia. Navy Capt. Frank M. Bradley has been nominated for appointment to the rank of rear admiral (lower half). Bradley is currently serving as executive assistant to the chairman, Joint Chiefs of Staff, Washington, District of Columbia. Navy Capt. Daniel L. Cheever has been nominated for appointment to the rank of rear admiral (lower half). Cheever is currently serving as chief of staff, Naval Air Force, U.S. Pacific Fleet, San Diego, California. Navy Capt. Yvette M. Davids has been nominated for appointment to the rank of rear admiral (lower half). Davids is currently serving as assistant chief of staff for requirements, experimentation, and innovation, U.S. Third Fleet, San Diego, California. Navy Capt. William S. Dillon has been nominated for appointment to the rank of rear admiral (lower half). Dillon is currently serving as vice commander, Naval Air Systems Command, Patuxent River, Maryland. Navy Capt. Brian P. Fort has been nominated for appointment to the rank of rear admiral (lower half). Fort is currently serving as assistant chief of staff, Naval Surface Force, U.S. Atlantic Fleet, Norfolk, Virginia. Navy Capt. Peter A. Garvin has been nominated for appointment to the rank of rear admiral (lower half). Garvin is currently serving as executive assistant to the vice chairman, Joint Chiefs of Staff, Washington, District of Columbia. Navy Capt. William C. Greene has been nominated for appointment to the rank of rear admiral (lower half). Greene is currently serving as deputy commander, plans and policies, Naval Sea Systems Command, Washington, District of Columbia. Navy Capt. William J. Houston has been nominated for appointment to the rank of rear admiral (lower half). Houston is currently serving as director, Submarine/Nuclear Power Distribution, PERS 42, Millington, Tennessee. Navy Capt. Kevin M. Jones has been nominated for appointment to the rank of rear admiral (lower half). Jones is currently serving as assistant commander for supply operations and logistics policy, Naval Supply Systems Command, Mechanicsburg, Pennsylvania. Navy Capt. Sara A. Joyner has been nominated for appointment to the rank of rear admiral (lower half). Joyner is currently serving as director, Navy Senate Liaison, Office of Legislative Affairs, Washington, District of Columbia. Navy Capt. Frederick W. Kacher has been nominated for appointment to the rank of rear admiral (lower half). Kacher is currently serving as chief of staff, Naval Surface Force, U.S. Pacific Fleet, San Diego, California. Navy Capt. Timothy C. Kuehhas has been nominated for appointment to the rank of rear admiral (lower half). Kuehhas is currently serving as commanding officer, USS George Washington (CVN 73), Norfolk, Virginia. Navy Capt. Carl A. Lahti has been nominated for appointment to the rank of rear admiral (lower half). Lahti is currently serving as chief of staff, Navy Installations Command, Washington, District of Columbia. Navy Capt. Andrew J. Loiselle has been nominated for appointment to the rank of rear admiral (lower half). Loiselle is currently serving as executive assistant to the Deputy Chief of Naval Operations for operations, plans, and strategy, N3N5, Office of the Chief of Naval Operations, Washington, District of Columbia. Navy Capt. Thomas J. Moreau has been nominated for appointment to the rank of rear admiral (lower half). Moreau is currently serving as commanding officer, Naval Supply Fleet Logistics Center, Norfolk, Virginia. Navy Capt. John A. Okon has been nominated for appointment to the rank of rear admiral (lower half). Okon is currently serving as executive assistant to the deputy chief of naval operations for information warfare (N2N6)/director of naval intelligence, Office of the Chief of Naval Operations, Washington, District of Columbia. Navy Capt. Douglas G. Perry has been nominated for appointment to the rank of rear admiral (lower half). Perry is currently serving as chief of staff, U.S. Strategic Command Special Activities Atlantic/Submarine Force, U.S. Atlantic Fleet, Norfolk, Virginia. Navy Capt. Fred I. Pyle has been nominated for appointment to the rank of rear admiral (lower half). Pyle is currently serving as executive assistant to deputy chief of naval operations for integration of capabilities and resources, N8, Office of the Chief of Naval Operations, Washington, District of Columbia. Navy Capt. Erik M. Ross has been nominated for appointment to the rank of rear admiral (lower half). Ross is currently serving as chief of staff, Naval Surface Force, U.S. Atlantic Fleet, Norfolk, Virginia. Navy Capt. Paul J. Schlise has been nominated for appointment to the rank of rear admiral (lower half). Schlise is currently serving as deputy for weapons and sensors, N96C, Office of the Chief of Naval Operations, Washington, District of Columbia. Navy Capt. Michael W. Studeman has been nominated for appointment to the rank of rear admiral (lower half). Studeman is currently serving as commander, Joint Intelligence Operations Center, U.S. Cyber Command, Fort Meade, Maryland. Navy Capt. Peter G. Vasely has been nominated for appointment to the rank of rear admiral (lower half). Vasely is currently serving as deputy director for operations, J3, Joint Special Operations Command, Fort Bragg, North Carolina. Navy Capt. James P. Waters III has been nominated for appointment to the rank of rear admiral (lower half). Waters is currently serving as deputy executive director, Office of the Chief of Naval Personnel, Arlington, Virginia.